Police have named the man killed in a gas and dash incident that occurred at a Fas Gas station in Thorsby, Alta. on Friday. Ki Yun Jo was the owner of the gas station, according to an RCMP release. Police have named the man killed in a gas and dash incident that occurred at a Fas Gas station in Thorsby, Alta. on Friday. Ki Yun Jo was the owner of the gas station, according to an RCMP release. Timothy Bembridge said he was friends with Jo. He said Jo would often be lenient if he couldn't afford the full price of the gas or a pack of cigarettes. "I'm devastated," Bembridge said on Saturday. "I'm going to miss him big time. I don't wish that on my worst enemy, the way he went down, getting run over, over gas." Police say a medium-sized white commercial cube van sped away from the Fas Gas station without paying for fuel when the fatality occurred around 3:45 p.m. on Friday. Police say the van was stolen. It has not yet been located as of Sunday afternoon. It has "Middleton Flooring Ltd." written on its front and side. Occupational Health and Safety is investigating the incident. Alberta Labour Minister Christina Gray said Sunday the government is working on policies that should better protect workers in the future. "At this point, because our consultations just wrapped in September a few weeks ago, we will be working as quickly as possible to bring these measures forward, making sure we prevent these incidences and keep workers safe," said the minister. Very few details were released Sunday and further information is expected later this fall. Bembridge said he stopped by the Fas Gas station about a half an hour before the incident. He only found out that Jo had died when he saw his friend's body lying in the street. Bembridge said that Jo had a wife and children and was an avid golfer. He also said Jo's gas station had been broken into a handful of times before Friday's incident. Bob Fedun was one of several people who put flowers at the scene of the crime on Saturday. 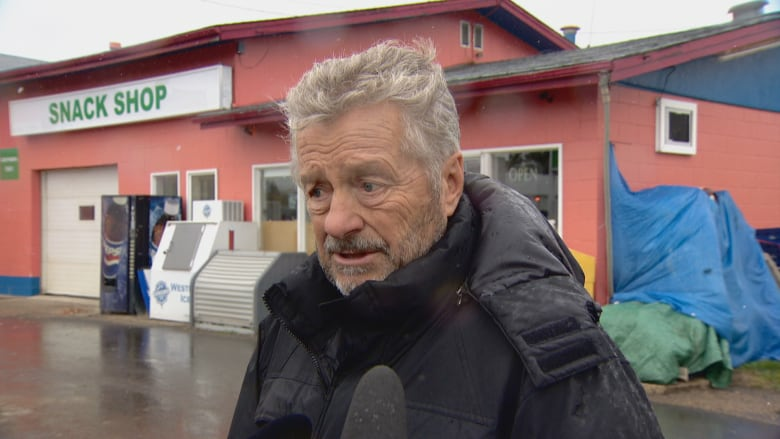 Fedun, a regular customer, says Jo was a trusting person and only required customers visiting the small town business to pay inside for their gas. "Unfortunately, he trusted everybody and the one time he probably shouldn't have, he paid the penalty for it," Fedun said. Friday's incident was not the only gas and dash police dealt with that day. Thorsby-Breton RCMP officers also responded to a call of a gas and dash in the Rimbey area involving a stolen school bus.